Jetpack Joyride Arcade Machine is a simulation video game in which the protagonist, Barry Steakfrikes, steals a jetpack! Players must collect coins, objects and power ups while avoiding obstacles in this super fun side scrolling game! This game can be played either as a ticket redemption game or played in straight arcade mode. To play, players must use the joystick controls on either side of the seat, pressing the triggers to activate the jetpack or vehicle in the game to move over obstacles/collect items. Vehicles the hero can use include the standard jetpack, a water vehicle called Wave Rider, and a soldier robot vehicle called Lil' Stomper. There are also power ups that players can get for temporary boosts, such as Super Boost which is a super speed power up. The game uses leaderboards for trakcing high scores and has a variety of missions for players to enjoy! The Jetpack Joyride cabinet features a 42" horizontal LCD screen, amazing sound and graphics to enthrall players, and also uses force feedback in the seat (vibrations) to simulate the use of the jetpack. This game can be played either as a ticket redemption game or played in straight arcade mode. To play, players must use the joystick controls on either side of the seat, pressing the triggers to activate the jetpack or vehicle in the game to move over obstacles/collect items. Vehicles the hero can use include the standard jetpack, a water vehicle called Wave Rider, and a soldier robot vehicle called Lil' Stomper. There are also power ups that players can get for temporary boosts, such as Super Boost which is a super speed power up. The game uses leaderboards for trakcing high scores and has a variety of missions for players to enjoy! 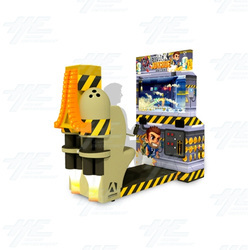 The Jetpack Joyride cabinet features a 42" horizontal LCD screen, amazing sound and graphics to enthrall players, and also uses force feedback in the seat (vibrations) to simulate the use of the jetpack.